Lightning Strikes outside the St. Thomas Church, causing it to split into 2. The community then helps chip in to help build a new one. Brooke is a single mother to a son named Alex, who is diagnosed with leukemia. This story wanted me to keep on reading! I could picture everything that I read like it was really happening. The characters go through tough situations that can happen to anyone! This book has happy moments as well as sad moments, so you will may laugh and cry at come parts. I have not read many Christian-Fiction books and this is very well written! I recommend this book! I hope William Sirls will write more books! 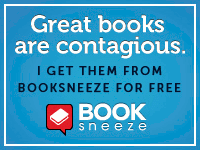 I received this book for free from Thomas Nelson and their program, BookSneeze and was not required to write a positive review.